Three young people, including a young leader from Girls’ Brigade Scotland, spent ten days in Kenya as part of the World Mission Fund’s ‘Kit for Kenya’ appeal. 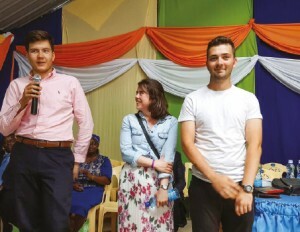 Fiona from GB Scotland, along with Greig from 1st Cumbernauld and Ian from 128th Glasgow, attended various church events and met with members of both BB and GB in Kenya. They even got the opportunity to attend a joint camp attended by 500 members of both organisations!